Wow! If you haven't seen it already and are in need of some inspiration or are simply curious to know how some interesting and utterly beautiful soaps are made, you must have a look at Tiggy's fantastic video tutorial. Tiggy, from Future Primitive was recently featured on The Soap Bar blog. The tutorial is in two parts and is so simple, clear and very inspiring (although she makes it look much easier than I imagine it is, lol). 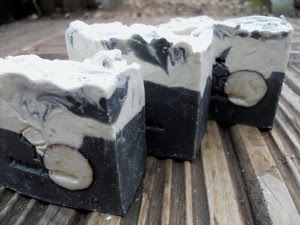 It demonstrates how she creates her gorgeous Humbug soap which features a lovely circle right in the centre (pictured above). Visually stunning. Her video can also be found on her Future Primitive Blog. Do go and have a peek at some of the other beautiful soaps when you visit - they are just lovely. thank you so much Helen. Oh, and of course I'm happy for you to post this! Thanks for pointing to my my blog as well. i cant find this tutorial.